EVESHAM TWP., N.J. (WPVI) -- A Burlington County man has been arrested after police say he ran out of a vehicle naked multiple times in two townships. 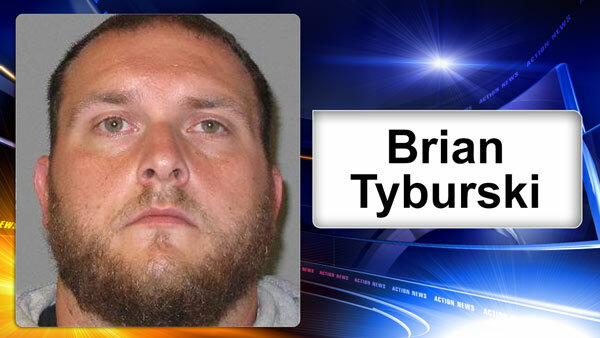 Police identify the suspect as 29-year-old as Brian Tyburski of Shamong Township, New Jersey. Authorities began investigating several reports of lewdness in both Medford and Evesham townships back in December 2016. In each of the incidents, witnesses said a man exited a Jeep while naked. One incident took place shortly after 1 p.m. on December 30. Evesham Township police were called to Ravens Row and Fox Chase Road. A man told police his 15-year-old daughter and her 14-year-old friend ran into his home after reporting that a naked man got out of his vehicle and ran toward them. On Monday, another incident was reported in the Tamarac section of Medford Township. It was reported a man exited a Honda Civic while naked. Medford police were able to ID Tyburski as the suspect. On Tuesday, police say Tyburski admitted to the incidents in Medford and Evesham. He was arrested and charged with multiple counts of Lewdness. Tyburski was then turned over to Evesham Township police. Evesham police charged Tyburski with 3rd degree Endangering the Welfare of a Child and a disorderly person offense for Lewdness.